YUM – those look fantastic! LOVE the Guiness and multiple chocolates. Bookmarking this now! Ohh… a new brownie recipe! Not sure how I missed this in March, but it looks excellent. They look wonderfully decadent. I’m not a beer drinker, so I cannot imagine how the Guiness effects the taste but they look like a chocolate lover’s dream! Hey! JUST saw this. (I’m so late to the party.) So glad they were a hit! Yes – so fudgy and decadent. I have no idea why the white chocolate, either, but there ya go. I’ve never made brownies with it before! 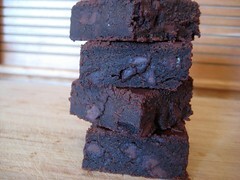 Just made these into car bomb brownies, with a baileys cream cheese swril. Amazing!